Why do some SD cards have two rows of pins? Most of us are well aware that SD cards differ in speed and capacity, but some cards are now physically slightly different too. 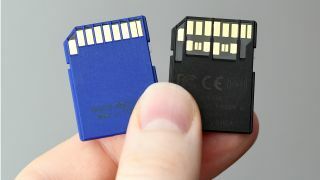 Whereas most SD cards have just a single row of pins on their rear, some now sport an additional row underneath this. But why is this? The answer to this concerns the UHS standard of the card. UHS stands for Ultra High Speed, and SDHC and SDXC cards are now marked with a UHS rating as standard. Essentially, the higher the rating, the faster the card is able have information written to it (and read from it). So, the UHS rating provides the user with a quick way of understanding what kind of performance they should expect from a card. Most SDHC and SDXC cards fall into one of two camps: UHS-I or UHS-II. You can tell which camp a card belongs to by looking at the icon of Roman numerals on the front of the card. So what does each of these mean? UHS-I cards are designed with one row of pins, which is the standard design SD cards have always adhered to. UHS-II cards, however, are all designed with two rows of pins – and this also applies to microSDHC and microSDXC cards that are accepted by some cameras, but more widely used in mobile devices. It’s this extra row of pins that provides UHS-II cards with performance advantages. The SD Association claims that UHS-II cards allow for transfer speeds to be tripled over UHS-I cards. So, whereas UHS-I cards have a maximum transfer rate of 104MB/s, UHS-II cards up this to 312MB/s. Because of this, UHS-II cards are particularly useful in cameras that have to deal with a high amount of data at the same time. Many cameras don't even support the UHS-II standard yet, but if you look at the ones that do, they are typically those that offer high burst-shooting rates, high megapixel counts and/or 4K video – all of which place extra demands on the memory card. As all of these cards have that same first row of pins, you can still use UHS-II cards in models that do not support the standard. You won’t, however, be able to appreciate any advantage in performance. There is also a newer third standard, UHS-III. This also uses this extra row of pins, but these can offer double the transfer speeds of UHS-II cards at up to 624MB/s, among other advantages. UHS-III is really intended for things like 8K video recording and 360-degree cameras, so it’s not something most people need to worry about – particularly as the standard is so new that there are no UHS-III cards available yet at the time of writing. In any case, if you own a relatively recent camera, and you tend to shoot either 4K video or long bursts of images in one go, you might find it worthwhile to check your manual (or your camera manufacturer’s website) to see whether your camera supports UHS-II.